This weekend, I did the unthinkable. I finally said goodbye to the Pampers, drew within the lines and took off the training wheels and and and… BOUGHT A CAR! At first, I figured I needed to go into this with a loin cloth, a sword and a shield, ready to battle the ever-popular, highly-dreaded salesmen for a reasonably priced car… which is about as common as people dressed as gladiators. My mom promised we were just going to look at this car we’d seen online, so I left my loin cloth at home and also we aren’t allowed to have swords in the house. I was–at first–ill-prepared, because the second I removed my seat belt, the lions were charging at us and fifteen minutes later, I was in the middle of a test drive. I hadn’t even come up with a code word with my mom! But we went in, were surprised by the ease of the sale and the lack of a desserts-themed code word or a suit of armor, and a couple hours later, I drove off in my new ride! The worst part? The fact that I had to listen to the radio on the way home. The radio is awful. Who would have thought Led Zeppelin only had three songs?! Needless to say, being spoiled with working blinkers, air conditioning, no flashing, scary brake or check-engine lights flashing at me and working speakers(!! ), I was content to listen to the same five songs on my way home. 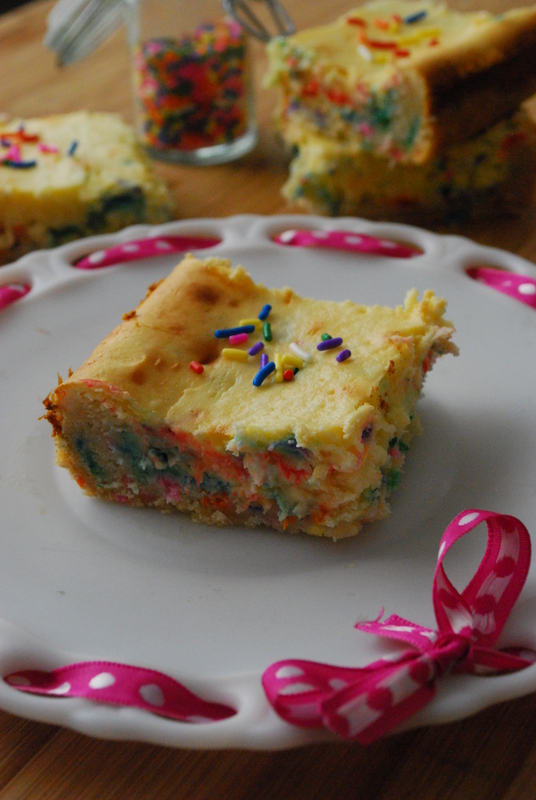 Home, where I had these amazeballs Funfetti Cheesecake Bars waiting for me. Sort of like a preemptive congratulations, if you will. These are beyond rich & hardly for the faint of heart. 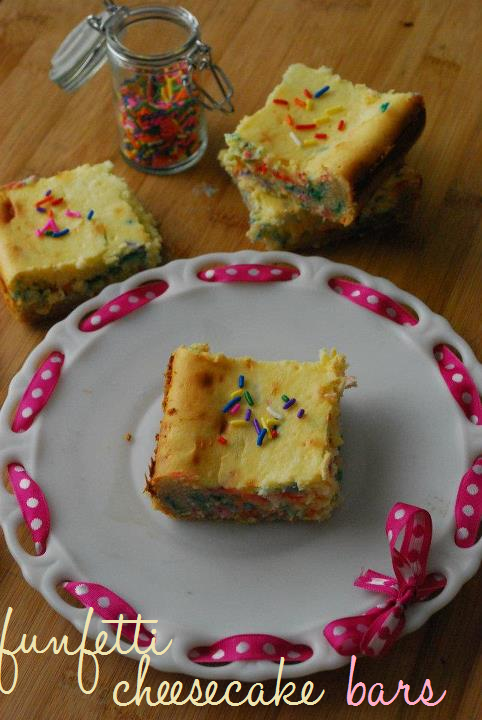 They’re unrelentingly sweet from the decadent Funfetti cheesecake filling and are smothered in rainbow sprinkles, which pretty much could cure the world’s problems if people were open to more rainbow goodness in their lives. 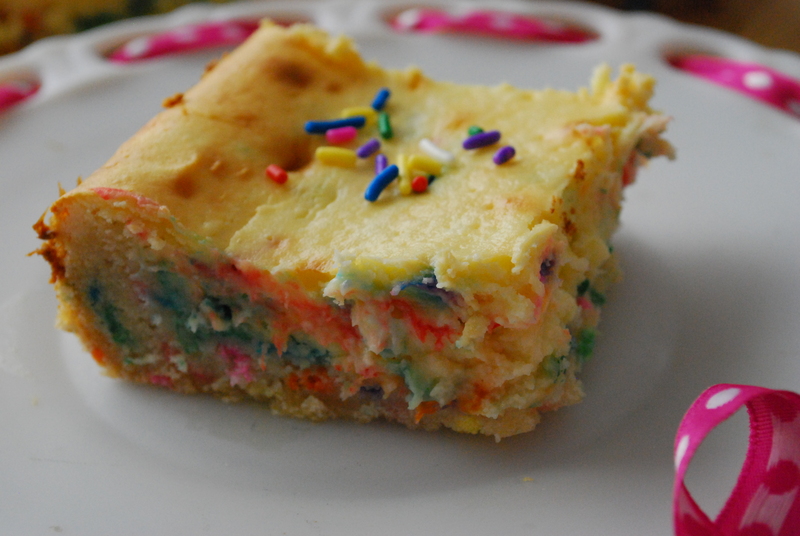 Funfetti Cheesecake Bars *inspired by Megan’s Munchies recipe HERE! 1. Preheat oven to 325 degrees F. Liberally grease a 13×9 inch baking pan and set aside. 2. In a large bowl, mix together the cake mix and melted butter until a crumbly dough forms. Press the dough evenly into the bottom of the baking dish. 3. In the same bowl, beat together the Funfetti frosting, the cream cheese, eggs and vanilla extract with a mixer until blended and smooth, about several minutes. Stir in sprinkles (about 1/2-3/4 cup) if desired. Pour the mixture into the prepared pan and bake for approx. 40-45 minutes or until the center is just set and the edges are lightly golden. 4. Allow the bars to cool completely before refrigerating for at least 3-4 hours. Serve chilled and store airtight in the fridge for 1-2 days. Now excuse me, but someone has to eat these. This sounds wonderful! I love cheesecake bars and this recipe looks easy enough. Congrats on getting the car – it’s tough to do sometimes and can be a grind just getting from the test drive to the tag, title, and tax but it looks like you made it through with flying colors! 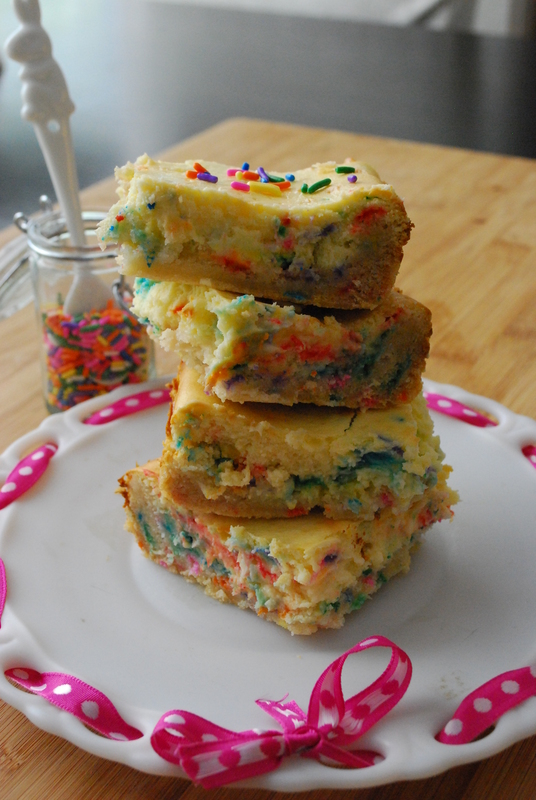 Funfetti, cake mix bars, cream cheese…yes a fan of all! LOVE that you put cream cheese and frosting together IN the actual batter. We both baked with cream cheese over the weekend!! TWINSIES! CONGRATS ON THE CAR!!!! Love it. So fun, easy and fast (at least until the cool down part.) Congrats on the new car!!! Congrats on the new car! It is kind a scary purchase, but kind of like ripping off a band-aid. Feels better when it’s over. 🙂 Enjoy it! Also, these cheesecake bars look awesome. I could totally eat my weight in anything cheesecake like. You’re right, that’s actually a great analogy! It was stressful and nervewracking, but then I was like, phew–I’m so glad it’s done! I am loving that there is frosting in the cheesecake! These must me good!